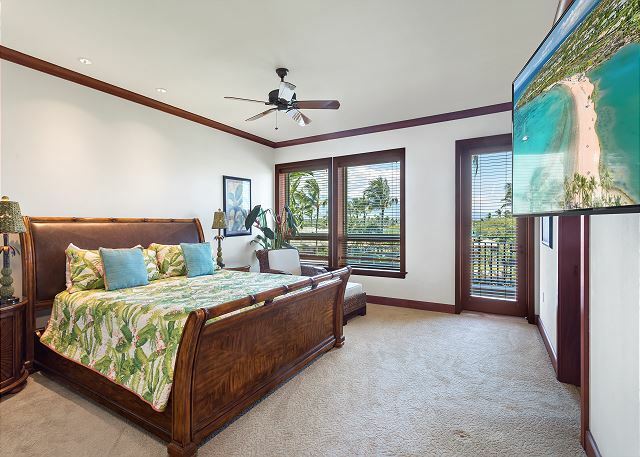 Kolea 8E is a three bedroom, three and a half bath villa with a sweeping view of Hualalai and an impeccable ocean view of Anaeho’omalu Bay. 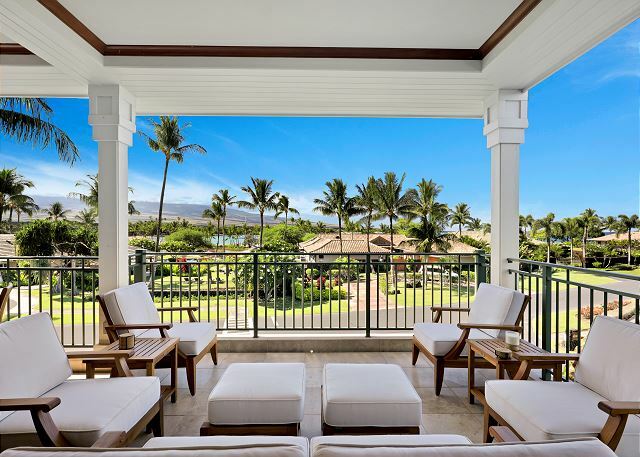 It is one of the few front row villas that also overlook the private Kolea Beach Club, where Kolea guests are invited to enjoy the infinity pool, spa, exercise hale (house), sand bottom keiki (child) pond, barbecue grill and kitchen. 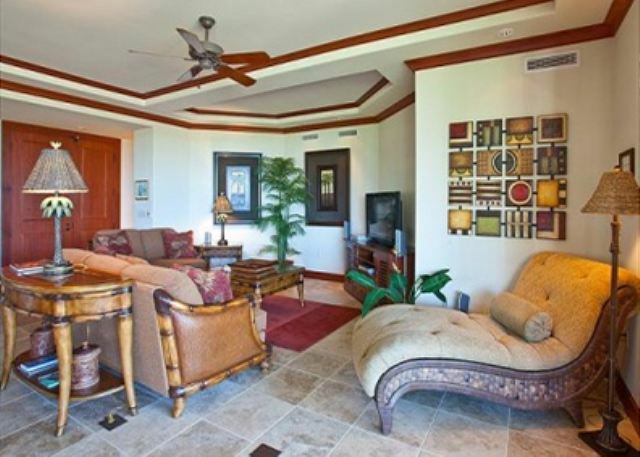 This upper level villa has been decorated with a warm tropical feel. Open the large lanai doors and hide them completely in the wall pocket to invite the ocean breeze into your living area. Out on the lanai, the summer kitchen is equipped with a stainless steel gas grill, sink and outdoor refrigerator. The teak cabinetry and granite countertops add an elegant touch to a relaxing barbecue meal at the lanai table for four. The lanai expands to fit 2 additional couches and ottoman, all with comfy cushions. 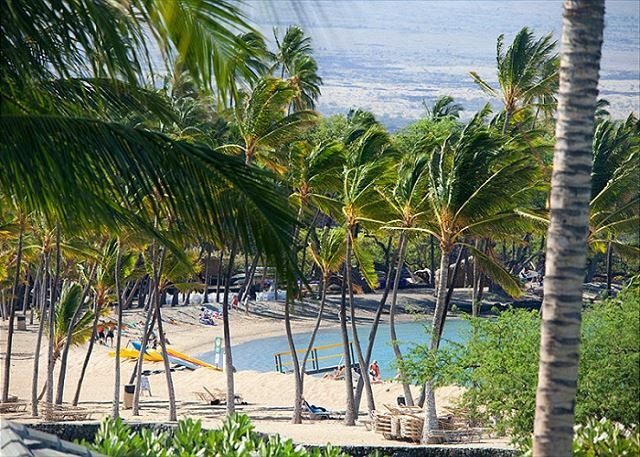 Take in one of the best Kolea views while lounging during lazy mornings, or happy hour! The open floor plan of the kitchen, dining room and living area provide ample space for everyone in the family. Recessed lighting and pendant lights are zone controlled for custom settings. 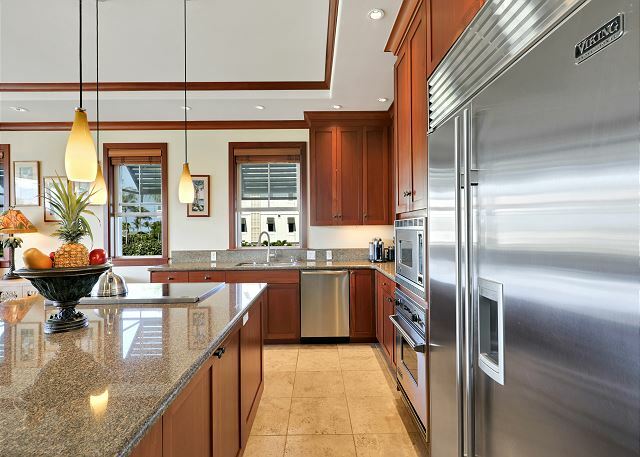 The spacious kitchen has a granite island with a built in cooktop and wine cooler. Top of the line appliances go on to include the stainless steel refrigerator, microwave, oven and dishwasher. The kitchen is fully stocked and ready to provide warm home cooked meals. 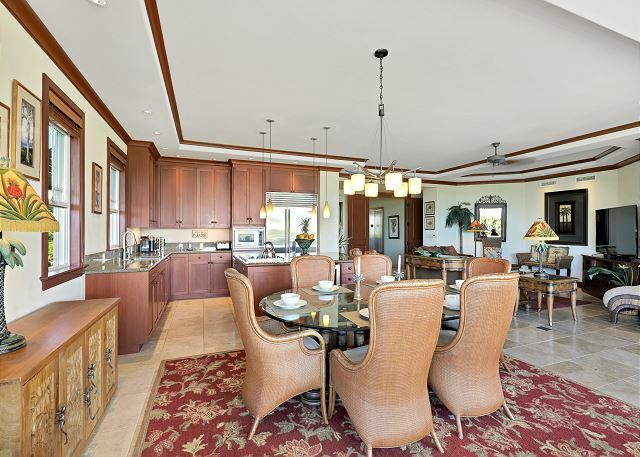 The large glass dining table has seating for six and two additional chairs at the island provide additional seating. The living area invites you to fall into one of two overstuffed couches or a royal size chaise lounge. The Pioneer flat screen television is enhanced with a home theater sound system. The king bed in the master bedroom has a lovely bamboo headboard lined with leather. A tropical arm chair and matching ottoman provide a quiet sitting area. 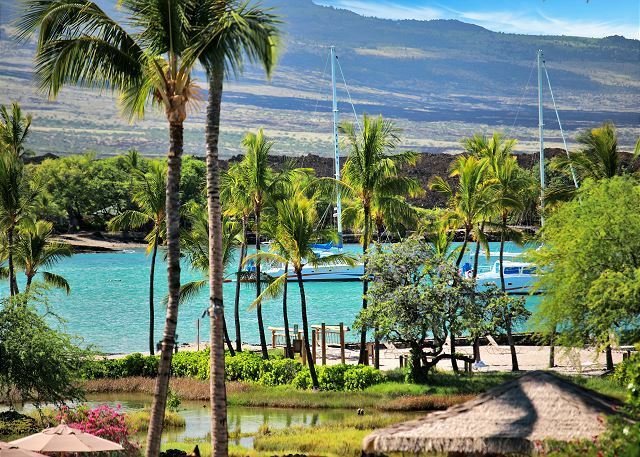 The view from the master looks out to the Kolea Beach Club and Anaeho’omalu Bay. A six drawer dresser is hidden in the large walk in closet. This room also has a television with built in DVD/VHS capabilities. The master bath has dual vanities and a great deep soaking tub with a handheld sprayer. The large travertine walk in shower is illuminated with natural light from the high windows and both showers have hand held sprayers as well. 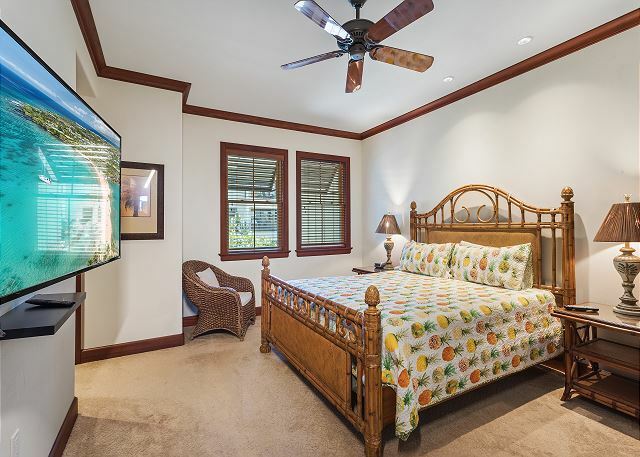 The guest master suite is directly across from the master and has a king size bed with a ginger carved wooden bed frame. The armoire houses a combination TV/DVD/VHS player. Matching nightstands and an arm chair complete the ensemble. A deep walk in closet has a six drawer dresser. The guest master has its own large private bathroom complete with dual vanities, an elongated soaking tub and travertine walk in shower. 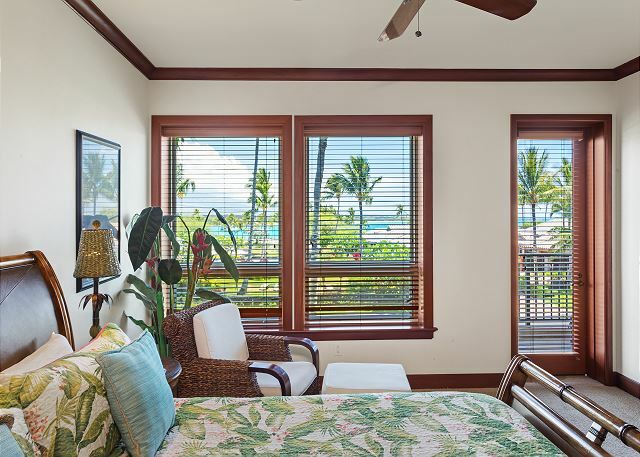 The third bedroom is furnished playfully with two twin beds with wooden ginger trim headboards. 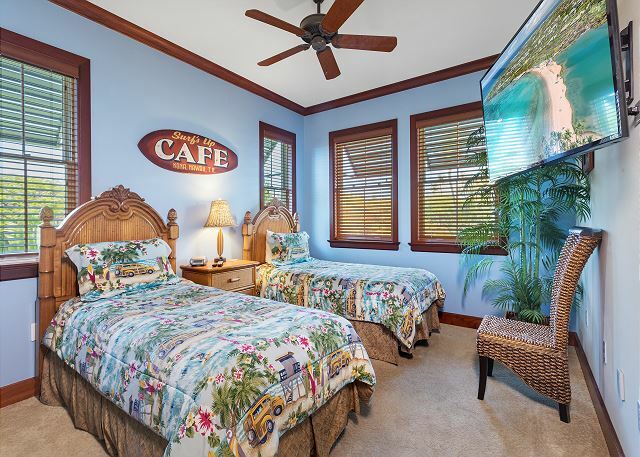 The room is styled with an uplifting surfing theme. It also has a private bath which includes a vanity and walk in shower. The bedroom has a full size closet. Air conditioning and ceiling fans circulate cool air throughout all rooms.